Yay – finally a good day, with a good run. I’m dithering about entering a really tough trail race, so thought I’d run part of the route and see how I felt. 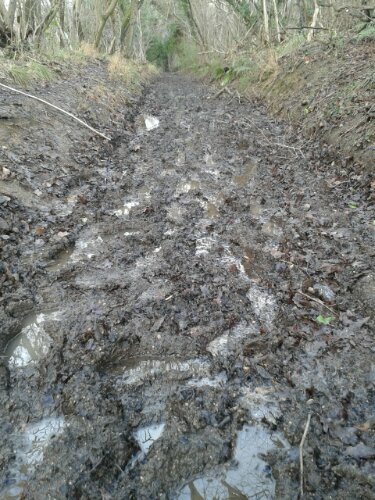 It’s one of the muddiest sections, slithering downhill through the woods, followed by a steep hill back up to get home again. I felt proud of myself for heading off on this run as although it’s not a long route it’s really hard. The mile down a track to get to the woods was windy, blustery and cold. The path then drops down towards the river and the mud starts. The path leads down into the woods and here it is sheltered and quiet. 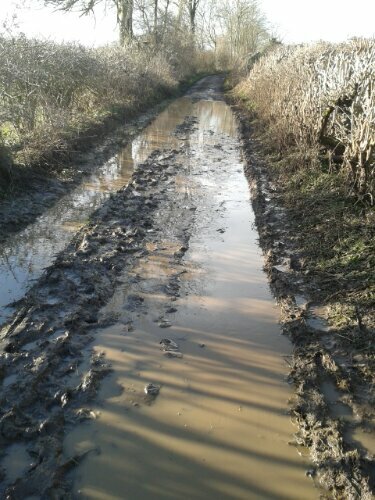 The route is steeper, the mud becomes slippier, and the hard work starts. Even my arms felt tired from windmilling around to keep me upright. After the stickiest point the path then starts to head back up and finally joins a lane. A sharp right turn leads to the steepest part of the hill which is the route home. 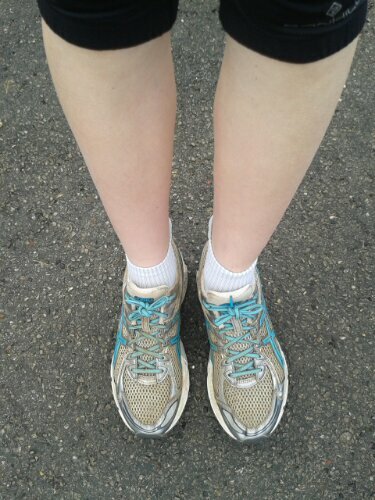 Turning into my drive, I took a final photo, an ‘after’ shot of my legs and feet. I seem to have changed the colour of my socks. ..
3.73 miles in 42:28, which included lots of photo stops, plenty of slips and many smiles. And just for good measure, a 1 minute 40s plank, *not* in pyjamas this time. Great effort — well done on the sock transformation! I was pretty impressed with the colour-changing socks myself. Fortunately they were a very old-and-already-grey pair I’d put on in anticipation! Blimey! now that IS muddy! 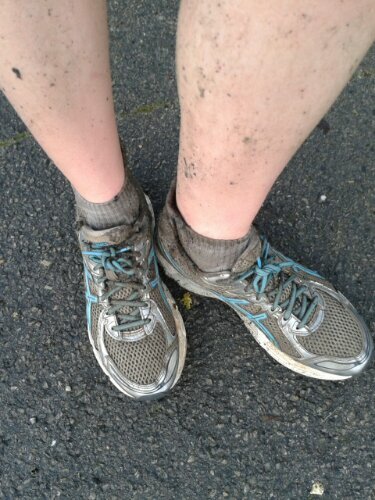 Never shall I complain about parkrun being muddy again. So did you make your mind up whether to enter the race? *Think* I will – just need to double check the diary, have a drink and a deep breath and just enter the thing! It’s not the getting muddy I mind, it’s the getting cold. Well done on going out and doing it. Between you and me, it *is* great fun. I secretly love coming home in a state that I would tell the kids off if *they* came home like that. Actually, last time they saw me coming home like this, they told me off! Previous Previous post: Janathon Day 2. Getting Worse.